Watch it on Vimeo or You Tube. Free download. 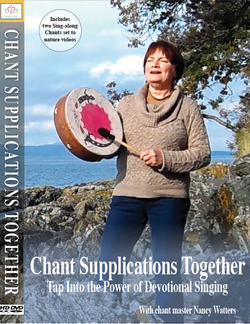 Chant Supplications Together is a 16-minute, multi-faith documentary that shows the delights of chanting in a variety of spiritual, cultural and musical styles--lively, as well as serene. For thousands of years people of all faith traditions have used chant to draw closer to God and to each other. Countless seekers, worshipers, mystics, and devotees, in every time and place, have shared sacred song. Chant is singing prayers and praising our Creator. It’s musical meditation--a way to uplift spirits and unify communities. It transports us to a timeless place of joy and oneness. The film shows how non-singers can easily participate, and how groups can quickly create simple chants, using the step-by-step process demonstrated in the film. Whatever sacred path you walk, this documentary is sure to uplift your spirit and inspire people of all faiths can connect heart-to-heart. Produced by Nancy A. Watters, with a grant from Wings to The Spirit Foundation. Videography by Chris Kruger. Chant Supplications Together was chosen as one of a select group of films shown at the Dawn Breakers International Film Festival, held in Switzerland Dec. 25-30, 2012. Congratulations and thanks to all who participated in making this documentary!